Hey there! Thanks for dropping by The Compass! Take a look around and grab the RSS feed to stay updated. See you around! I finished my third interview for the American Democracy Project sponsored in-depth campus crime story. The most recent interview was with the University of Nebraska at Lincoln’s assistant police chief and director of patrol operations Carl Oestmann. The University of Nebraska at Kearney’s director of police and parking services Michelle Hamaker and the University of Nebraska at Omaha’s manager of campus security Paul Kosel. So far the story is that campus crime is relatively low at all three campuses with the biggest problem areas being larceny and alcohol violations. Still, only a few crime rates rise to a level effecting more than one percent of the student population. Each of the campuses is taking measures to lower the rates of larcenies and other offences. Changes of interest are adding additional surveillance cameras around campus and allowing police officers inside residence halls. On the home front, UNK’s police force will employ an additional officer next semester charged with part time duties as a regular officer and part time investigating sexual assaults. No sexual offenses were reported at UNK in 2009 (the most recent data available), with four reported in 2008 and one reported in 2007. 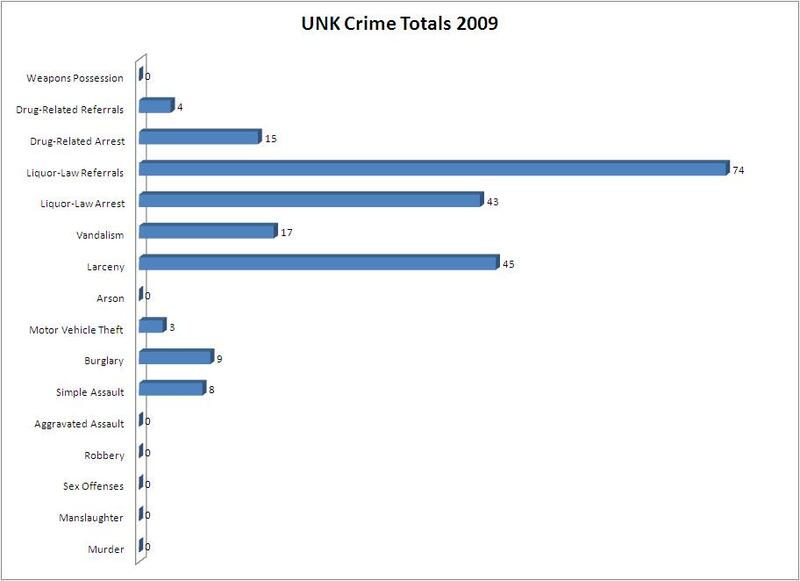 Below is a chart of the total offenses reported in UNK’s Campus Crime Report.